Shopping during Christmas time (yes, this was awhile ago) can often be an exercise in torture and self-punishment. Hence, going to places such as Metrotown and Guildford Town Centre is the equivalent of navigating Richmond during rush hour. Even the smaller malls aren't immune as finding a parking spot requires either overly aggressive behaviour or stalking 101. However, there is one mall that is generally not busy and finding parking near the entrances a breeze. Yes, you guessed it, the place is Tsawwessen Mills. We went all the way out there to shop and enjoy the relative tranquility. After that, we hopped on over to nearby Pho Saigon for some eats. Just like the location in Ladner, the place is pretty humble, but decorated with customer-made scribbles on the walls. 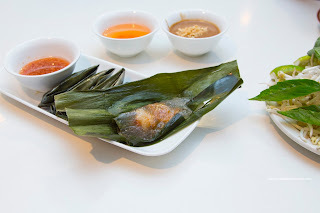 We started things off with the Banh Ba Lot that was quite good. 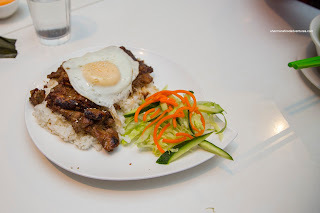 It had the requisite chewy, sticky and bouncy tapioca texture while stuffed with pork, mushroom and shrimp. Loved the dipping it into the tangy chili fish sauce. 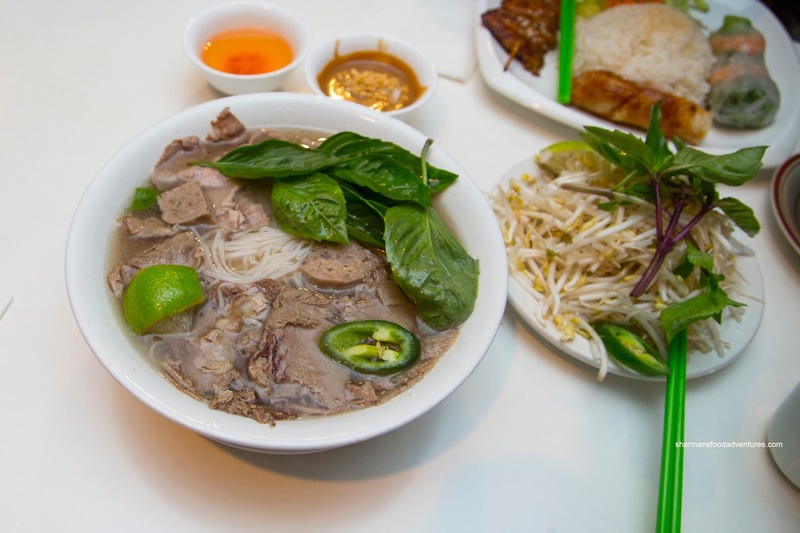 For myself, I had the Pho Dac Biet and it was a fair portion. I thought the soup was a little light and a touch muddled. However, it was still relatively flavourful and pleasant. I found the noodles to be al dente while the meats were tender. 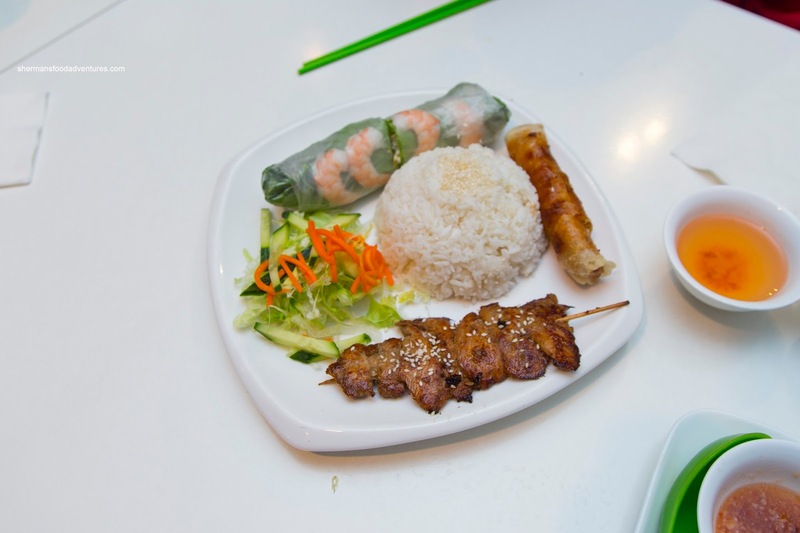 For Viv, she had Combo A consisting of salad roll, spring roll (made with rice paper) and chicken brochette with rice. As mentioned, the spring roll was legit being crispy while a touch greasy. The salad roll was haphazardly constructed, but was solid nonetheless. A little dry, the chicken skewer could've used a bit more seasoning. My son went for his usual Lemongrass Chicken with rice. We added an egg to the dish and it came out fully cooked. Totally disappointing because the whole point is to have a runny egg with the rice. The chicken was a bit similar to the skewer being a touch dry and lacking enough impact. My daughter didn't go overboard this time and went small with a Kid's Pho Ga. 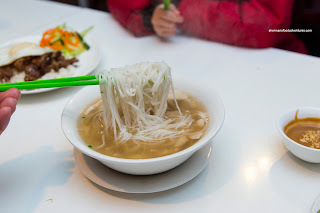 This was quite a large portion of chewy noodles and mild-tasting chicken broth. The pieces of chicken were on the drier side, but were still okay. In the end, that is all we were looking for anyways - decent eats. 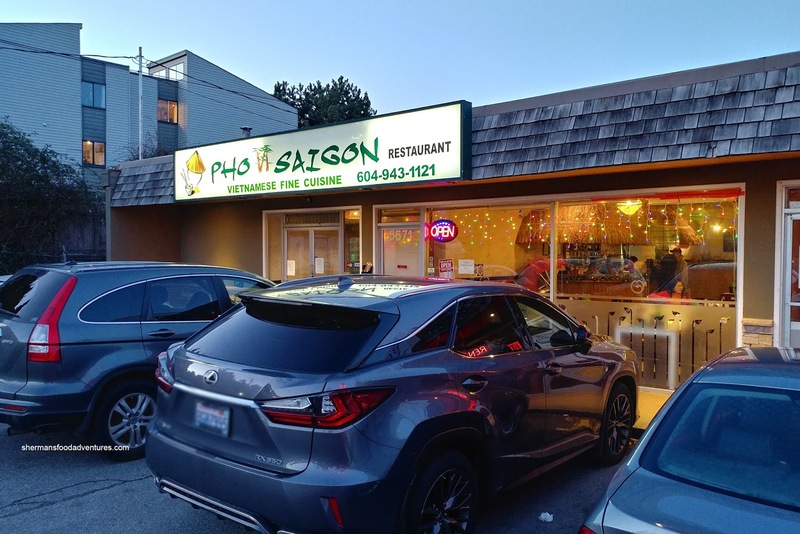 Pho Saigon was more or less that, but nothing amazing. I guess with the lack of competition in Tsawwassen, they won't need to be anything more than decent. The Big Flat Pancake Co.